Western Filament is a worldwide leader in high-performance fishing line and fibers, and TUF-Line is a part of their company that has pioneered the use of Spectra and Dyneema fiber in fishing line. The DuraCast braided line is engineered specifically to be tough and abrasion resistant for all aspects of use on both spinning and casting reels. It is undeniably difficult to compare fishing line because each brand of line offers some type of advantage or disadvantage over the others, depending on the specific angler and application. Therefore, the most reliable evaluation of fishing line comes from how the line performs in both the applications the line is marketed for, and the claims the manufacturers make. 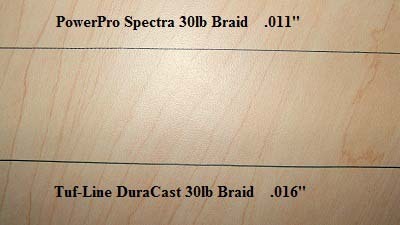 No Rod Guide Noise: While the DuraCast line does not flow through the rod guides with absolutely no noise at all, it does cast fairly quietly compared to other lines. This is due to the stiffness in the line that keeps it straight and on track as well as the waxy coating that allows it to slide easily through the eyelets. Eliminates Wind Knots and Tip Wraps: TUF-Line claims that the DuraCast line eliminates wind knots and tips wraps. This is actually true to an extent because the line is not very limp or flexible. It has a waxy coating over the line which makes it feel like a mix of mono and braid. While I did notice that there were reduced wind knots and tip wraps while casting and fishing in the wind, I wouldn’t say that it completely eliminates them. Permanent Coloration: The coloration on the DuraCast line is different from other braids that are dyed and fade over time. I have had numerous dyes from braids come off on my fingers while spooling the line, however, the coloration for the TUF-Line is done in such a way that it is engrained into the line and will not fade over time. Definitely a plus. Ultra Round Tri-Axial Construction: The line is constructed to be full-bodied and ultra round, which is supposed to eliminate wind knots and tip wraps as well as ensure long durability by providing increased abrasion resistance. Superior Casting: The DuraCast line is engineered for superior casting ability and designed to produce explosive distance. I would agree with this claim as long as the lure is weighted enough to get the heavier and thicker line moving. Once the line begins to fly off the spool it can cast very far distances, especially in the wind due to its more stiff and durable build. Pinpoint Accuracy: The line supposedly offers pinpoint accuracy; however, I am skeptical of how line can actually provide accuracy. The accuracy and handling of the line comes from the angler rather than being built into the line. Unparalleled Abrasion Resistance: TUF-Line claims that their DuraCast line offers the highest abrasion resistance. I would have to agree with this claim, the line is very abrasion resistant, and I even felt comfortable using it while flats fishing. The DuraCast braided line was tested in a variety of different fishing applications and environments, including freshwater settings, saltwater settings, spinning reels, casting reels, and in conjunction with a wide variety of lures. I found that the line definitely offers superior abrasion resistance to the majority of the braided lines I have used. The construction of the DuraCast line is very stiff compared to normal braids, and this seems to come from the tough waxy coating that surrounds the line. The braid appears to be more of a hybrid between mono and braid. The diameter of the 30lb test braid is significantly thicker, at .016’’, compared to traditional 30lb test braid of approximately .011’’. The thickness of the line is a positive factor for inshore fishing applications, however, it is slightly too thick for bass fishing and it would be better to downgrade to a thinner diameter if using the DuraCast for freshwater. As a result of the thick diameter, the line does not sit well on itself when it is spooled onto a spinning reel. 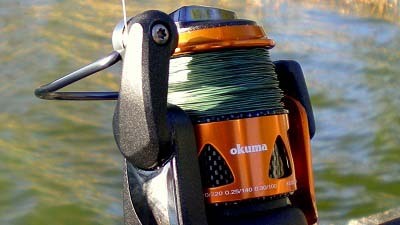 When the drag is used the line tends to dig into itself and shift the other line aside, which is a result of the extra stiffness causing the braid to sit loosely on the reel. The line casts very well when paired with a lure that is heavy enough get the stiff line moving through the rod guides. While testing the casting performance of the DuraCast in high wind conditions, the line did reduce tip wraps and wind knots, however, it is definitely not suited to work with light lures. In addition, I felt that the line actually performed better on a baitcaster rather than a spinning reel as TUF-Line recommends. Also the waxy layer on the line really helps when getting out birdnests, however, it does have memory unlike normal braids and can crease easily. I would personally recommend using the 30lb DuraCast line only for heavier lures including crankbaits, weighted rigs, and large spinnerbaits. Tying knots with the DuraCast braid is comparable to working with 20lb fluorocarbon; not much fun. The 30lb test braid diameter is slightly too thick for easy knot tying and cutting, and a diameter of 15lb of 20lb may be more suitable to use for bass fishing. One major design flaw is that when tying a uni-to-uni knot the knots will cut into the waxy layer of the line and strip it down to the bare fibers if you over tighten and slide the knots before they are close enough together. Overall, it is a tough line and the 30lb DuraCast has worked well for inshore and redfish fishing with a leader attached. 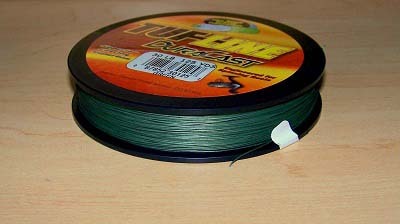 TUF-Line offers the DuraCast braided line for a very reasonable price and there is no doubt that it has excellent abrasion resistance. The line takes a different approach to braided line than the majority of the market, and I must applaud their creation of a braid that emphasizes abrasion resistance and permanent coloration. However, I feel that the durability and increased diameter of the line make it better suited for an inshore fishing environment where it can endure clam beds and outcropping rocks, rather than in a bass fishing situation where sensitive and finesse lines are required. 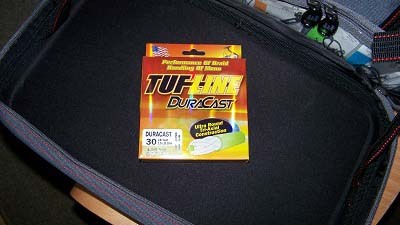 Overall, DuraCast is what they were going for, and DuraCast is what they achieved; the line has an excellent lifetime and it lives up to the claims made by TUF-Line.